Coats and B.R.E.A.D. - Planet Aid, Inc.
During the recent cold snap, Planet Aid again visited B.R.E.A.D. 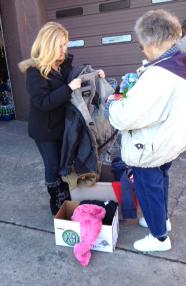 Ministries, Inc in Gastonia to distribute coats, scarves hats and gloves for adults and children. B.R.E.A.D. is a non-profit organization that provides food and groceries to the homeless, elderly and low-income residents.